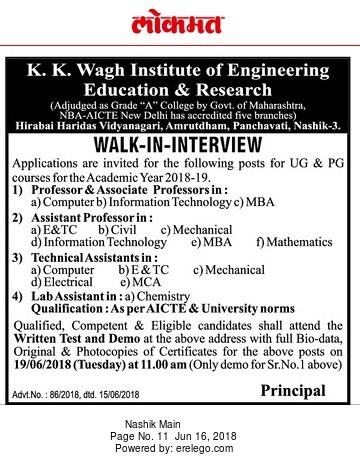 K.K.Wagh Institute of Engineering Education and Research, Nashik has advertised in LOKMAT Newspaper for the recruitment of Professor/Associate Professor/Assistant Professor job vacancies. Interested and eligible job aspirants are requested to appear walk in on 19th June 2018. Check out further more details below. About College: The institute was established in the year 1984 at Bhausahebnagar (Tal. Niphad, Dist. Nashik) and shifted to Nashik City in September 1986. A land of 8.2 hectares was generously donated by Shri. Kakusheth Udesi of Hirabai Haridas Chariteble Trust, Mumbai. The Society started building infrastructure at this campus (known as Hirabai Haridas Vidya Nagari) in the year 1987. As on date it is fully developed and provides accommodation for College building, office, classrooms, drawing halls, laboratories, workshops etc. Building with built up area of 32,199 Sq.m. is one of the largest buildings in the City. All laboratories, classrooms etc are designed as per the needs of the students. How to Apply: Interested and Eligible Candidate may bring your application form along with certificate with a set of photocopies and photographs to the following address on 19th June 2018 at 11.00 AM.